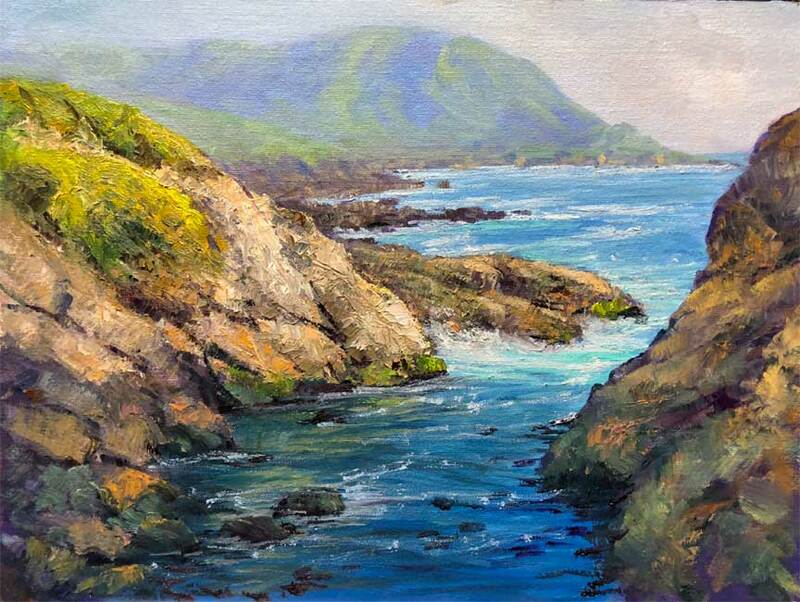 Creeks and Rivers of Silicon Valley – Just Stop and Paint It! John Joseph Montgomery, who some have called the ‘father of aviation’, did many of his flight tests on a hill in the Evergreen area of San Jose, over a century ago, predating the Wright Brothers flights. Montgomery Hill Park, behind Evergreen College stands as a monument to his efforts. I wrote about Montgomery and previously painted near where his historic flights took place in “The Creeks and Rivers of Silicon Valley” year long quest you can read about here. I recently purchased a drone, and fittingly my first flight was by the same hill Montgomery sailed down more than a century ago. I had been contemplating buying a drone for quite a few years, so finally got a DJI Mavic Pro, a portable compact quadcopter, and rated one of the best in the industry. It is small enough to fit in the saddlebags of my Harley, but has all the features of top end professional drones. Here is a short video composite of my first flights at Montgomery Hill. Yeah, I know it’s not like the stunning drone videos you probably have seen, but it’s a start! So why am I writing about drones in what is primarily an art weblog? Well, besides just being lots of fun, I have some ideas on incorporating drones into my art. So stay tuned, and Drone On! The quest started as a simple idea. I didn’t even know if I would, or even could finish it. After all, it was a commitment for a year. I didn’t know if any of it would turn out any good, or just a bunch of bad paintings for the scrap heap. I didn’t know if anything would be interesting or worth looking at. I didn’t know I would eventually paint ghost towns in Silicon Valley, or haunted springs, or wild beaver sign in a metropolitan city, or the worlds largest homeless camp, or the world’s first ‘plein air selfie’. I didn’t know eventually strangers would walk up to me, give me a hug, and say I brought back their fond childhood memories. I also didn’t know it would snowball in scope and public interest way beyond my first simple idea. Four years ago today, I started the year-long quest to paint a different “Creek and River of Silicon Valley” each week en plein air, or on location. The collection of 60 paintings is still intact and will be for the foreseeable future. I am still seeking venues both local and nationally for showings, so if any of you have ideas for venues, please let me know! Continuing the ”Creeks and Rivers of Silicon Valley” year long quest. Technically, it’s Don Edwards San Francisco Bay National Wildlife Refuge Education Center, which is quite a mouthful. 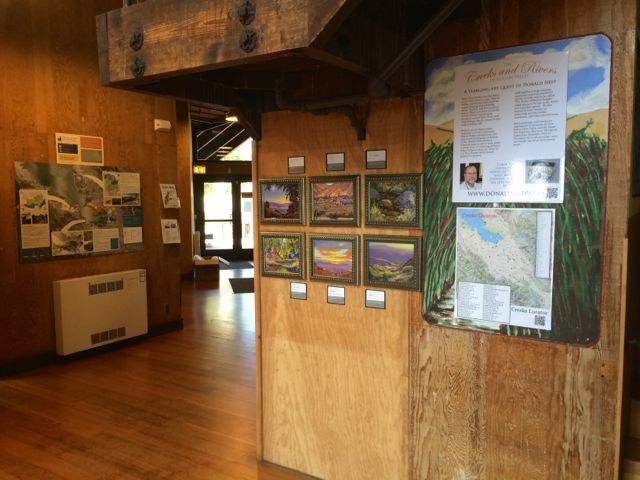 There are selected paintings from “The Creeks and Rivers of Silicon Valley” currently on display at the center. Today, they sponsored a reception and ‘meet the artist’. It turned out to be quite fun! We had some nice refreshments, then I talked for awhile, visited, and answered a wide range of questions. Some took a guided nature hike through part of the Refuge. I talked about art, indian legends, magic, ghosts, history, flight, conservation, the environment, but mostly about the creeks and waterways in Silicon Valley. My goal was for everyone to look ‘under the surface’ of what is around them in Silicon Valley to appreciate what used to be called “The Valley of Heart’s Delight”. From what I could tell no one fell asleep, and everyone seemed to have a good time! Just a few pictures of the afternoon courtesy of my friend, past work associate, and great photographer, Scott Loftesness. If you haven’t seen some of Scott’s photos, you should check them out here and here. The exhibit will be up until the late fall and we don’t really have an end date yet. If you haven’t seen it, or been out to the center, it is certainly worth the trip! During my quest of painting the creeks of Silicon Valley, I painted in many places, but almost all the creeks end up in the marshes of the San Francisco Bay in what is now called the Don Edwards National Wildlife Refuge. The Refuge encompasses most of the southern portions of the bay, and is a wonderful reclamation of land once used for industrial purposes. 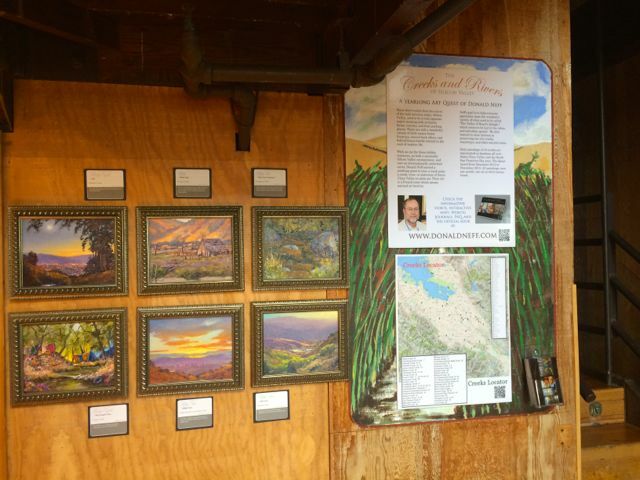 We put up 18 paintings specifically from the Coyote Creek Watershed in their Education Center today. The paintings will be on display now until the fall. A special event is scheduled for September 5, which is free, but you must sign up here. Continuing the ”Creeks and Rivers of Silicon Valley, Studio Editions”. The year long quest to paint “The Creeks and Rivers of Silicon Valley” has been so well received I am going to continue it, however in a completely different direction. 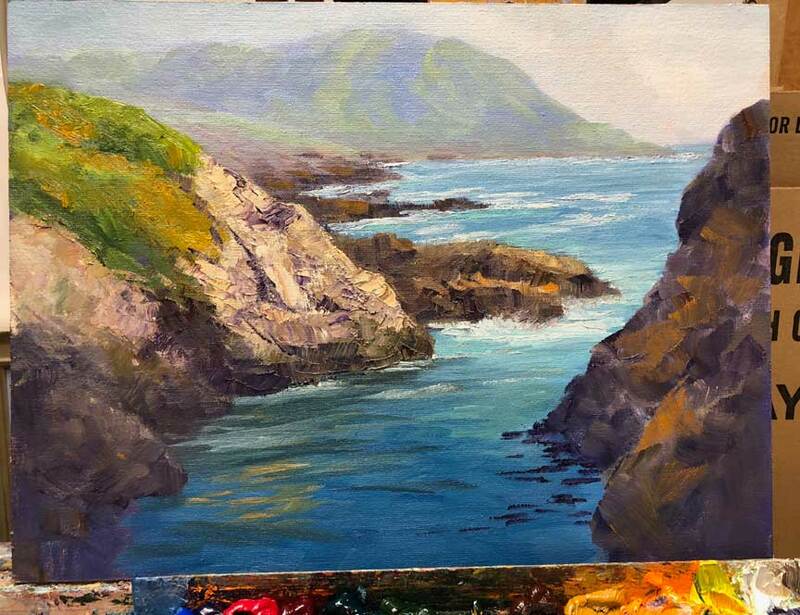 Over the next year, about once a month, I will do a larger studio painting of one of the plein air paintings done in the quest. The larger paintings will be different sizes, and not necessarily the same aspect ratio as the plein air. Some will be landscape orientation, and some portrait (vertical) as the painting requires. I will expand some into panoramas, and some just details of the original plein air. These studio works will be for sale. If you are interested, just email me privately at donald@donaldneff.com . I will also entertain requests for certain paintings. After a little touchup, varnishing, and re-shooting all the paintings in “The Creeks and Rivers of Silicon Valley” quest, I made this short video of the entire collection. Enjoy it along with a little Celtic music! Click on the picture above or if not shown, this link to view the video. 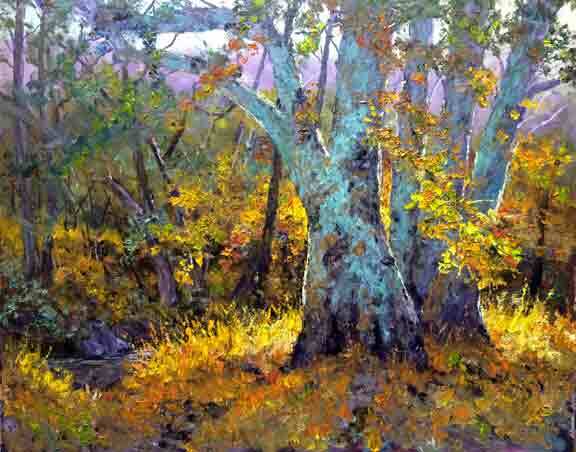 Plein Air Magazine also wrote a short article for their weekly electronic newsletter and Plein Air Collector web site. Click here to read. San Francisco Bay Wildlife Society posted an article about my painting of Drawbridge, an actual ghost town in Silicon Valley here. My year long quest to paint “The Creeks and Rivers of Silicon Valley” is over! 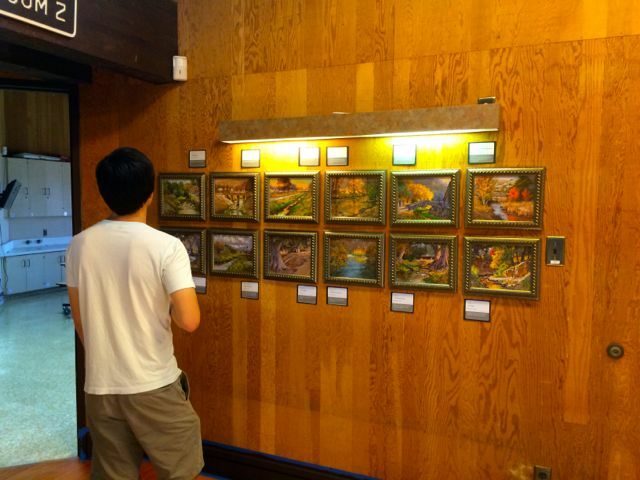 60 paintings of 43 creeks and waterways were produced. Please enjoy and share this short video celebration of the hidden beautiful spaces in our metropolitan areas with art. Morning…Afternoon…and Evening. We had an almost full moon rising around dusk today, so what better way to end this quest with a view of Silicon Valley with a full moon rising over the eastern foothills. 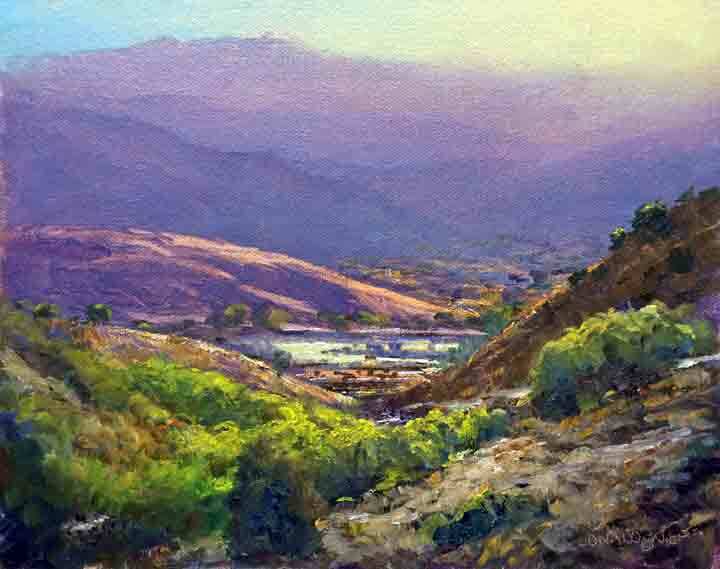 I am not as familiar with the western foothills of Santa Clara County where I wanted to paint this, so took me quite a bit of time on Google Earth, and just driving around, to find this scene. I also wanted it to be by a creek I had not painted yet. I settled on a view from Peacock Court in the foothills above Cupertino. In the distant valley you can see downtown San Jose. 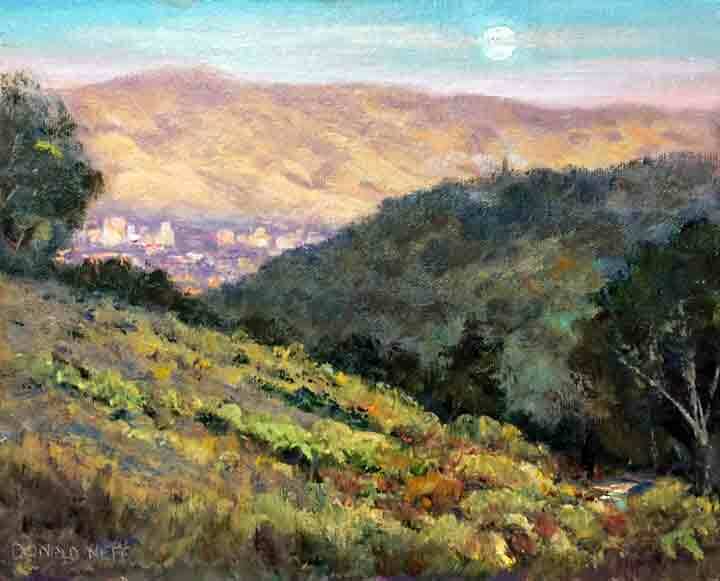 The creek is Swiss Creek and is a tributary of Stevens Creek, which I have painted several times in this quest. We were above Permanente Quarry and I could hear the equipment in the distance below. As soon as I turned onto Peacock Court, guess what I saw….a peacock! The rising moon was spectacular. In the pictures, it almost looks like a rising sun. I stayed until it was too dark to paint, and touched the painting up in the studio. I found a peacock on Peacock Court. The rising moon over Silicon Valley. Parked along Peacock Ct. and some nice mansions. My easel with the almost full moon. This ends the year long quest, but there is much more coming up! Just the painting part is over! I have a special surprise coming in a few days, and there is much more after that, so stay tuned! I am releasing the final three paintings in this quest as a trio, and here is number two. “…Afternoon…” was painted late in the day and since we just went off daylight savings time, the sun sets early around 5 o’clock. Most of you know I own and ride a Harley-Davidson motorcycle. Metcalf Road, as a backroads way going home, is a favorite ride. It’s a country road, and the first part, painted here, is steep and full of hairpin turns. You can see just a hint of the road on the right side. At the top of the hill, behind me, is the Metcalf Motorcycle Park for motocross dirt bikers. 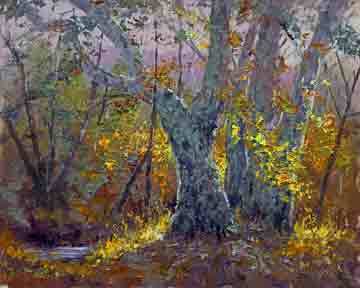 Metcalf Creek empties into Coyote Creek, one I have painted multiple times in this quest. The far hills are the coastal range of California, and you can barely make out the iconic radar building at the top of Mt Unumhum. Down below, you can see settlement ponds which is part of the Coyote Creek engineered system. You can also barely make out Hwy 101. I showed just a glimpse of Metcalf Creek at the bottom of the hill. Just to the right in the valley glare, you can barely make out the southernmost suburban area of San Jose. It seems every year, this line creeps further south as new neighborhoods are built. Just to the left in the valley, but not shown, is the Metcalf Transmission Substation which made national news awhile back with a sophisticated sniper assault. The basic scene I was painting. What a view and not far from my home! My easel as the sun was close to setting. Packing up, a view of my easel and SUV along Metcalf Rd. An artists note: I painted almost the entirety with a #10 filbert brush, Silver Ruby Satin brand, about 3/4 of an inch wide. Since the entire painting is in the distance and late in the day, I wanted a soft look throughout. The larger the brush you can use, the better! Also, some of the brightest parts on the hillsides are ‘take-aways’. I tone my canvas with Transparent Red Oxide, and lifting the paint reveals part of the undertoned canvas. This is quite an expansive view, and a little hard to fit on a small 8×10 canvas. It’s on my list for a large painting later on! I have a special surprise coming next week when the quest is over. Stay tuned!